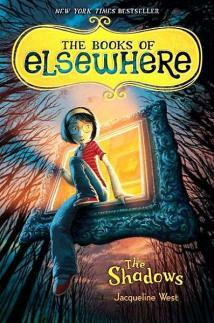 The Shadows is the first book in the Books of Elsewhere series. I love a mystery, and I couldn’t put this book down. My students can’t stop reading at the first book. They go on and read the next two books in the series. Wait until I tell them book 4 is coming out soon! Olive Dunwoody and her parents move into the McMartin house after Ms. McMartin passes away. Their new house comes with all the McMartin’s possessions. There are lots of interesting pieces of furniture and paintings on the wall. When Olive and her parents try to move a painting, they find all the paintings in the house are stuck to the walls. Olive’s parents leave Olive to her own devices, a lot. Olive is a curious girl. She uses her free time to roam around the house. Inside one drawer, Olive finds spectacles. She discovers that when she wears the spectacles, she can see people in the paintings move. Olive also learns that she can enter and leave each painting in the house. Olive meets people in the paintings. One of the people she meets is a little boy, Morton, who is desperately afraid of a man he says put him in the painting. Olive is determined to solve the mystery of people in the paintings and to discover the secrets of McMartin family and their home. But, it is said that “curiosity killed the cat.” Will Olive survive her search for the truth about the paintings? Recommended for tween readers who love a good, exciting mystery.